NX is een protocol voor toegang op afstand. Het is zowel snel, veilig, grafisch en open (in tegenstelling tot het Telnet-protocol, dat alleen snel en open is). NX is basically a client-server protocol, that allows you to graphically access any machine, It is based on both SSH (for security) and X Compression (for GUI and speed), and NX is much easier to use than normal X protocol. This How-To describes how to use SUSE Linux 10.0 as a Terminal Server, how to configure stuff, and how to connect to it. Insert the first 3 lines in the above textblock just before the last line in that block. after that you will be prompted for a password which can be anything, however you have to type it twice. The FreeNX package is no longer present in the official openSUSE 11.2 repositories. However the packages are available in the Build Service. Install NX and FreeNX rpms from here and here. The versions from the repository X11:RemoteDesktop/openSUSE_11.2 should work fine. Replace 11.2 with 11.1 with the version of openSUSE you are running. As pre-requisite before installing the rpm above, you may need to install packages like expect and rdesktop. Install using YaST's Software Management or zypper on command line. Use nxserver --status to check status of the server. The server runs on the ssh port, 22. Test connecting using any NX client. Official No Machine client can be downloaded from www.nomachine.com which installs the client binary at /usr/NX/bin/nxclient See http://walter.deback.net/blog/archives/19 for using the NX client effectively. If you are, like me, running SUSE Linux 10.0 - you will need to install FreeNX package (the server) using YaST (freenx is on SUSE CDs/DVD) as well as some client software (to test on local machine) - you can use freeware NX Client (from www.nomachine.com/download) or use Open-Source "knx" - the standard KDE NX Client. After setting up the procedure is damn easy. If it returs nothing, then install it using YaST. If returns "FreeNX-0.4.4-4" like in my case, then all is OK.
At least in openSUSE 11.1 you will see some checks done. Some will fail but may be harmless unless you want these features working. At the end a test session will be done which should succeed. You may want to save the output of nxsetup in a text file for later reference. 3) start any NX client - I use NoMachine's - and type: localhost as my host, 22 as my SSH port - after all NX is based on SSH, my user's name & password, desktop: UNIX/KDE set the resolution press ok - and - everything works wonderfully ! Congratulations ! ! ! You are done ! The next paragraphs are strictly optional for Advanced NX configuration. You don't need to read them to make NX working. 1) Using existing (Windows ?) Workstations and simply install NX Clients on them. 2) Use LiveCD that comes with NX Client. Newer Knoppixes do. v3.9+. NOTE1: Unfortunately, the SUSE Live DVD do not meet the specs - it doesn't include NX Client _and_ doesn't include UnionFS to install the NX Client. SUSE Live DVD can still be used - but you will have to manually install the NX client with user account but it's harder than Knoppix. 3) Use discless distributive, such as thinstation or 2x.com. a) the freeware NoMachine's "NX client" (closed-source). Advanced client. b) and an open-source KDE "knx" client. Simple Client. 1) Windows 95...XP - must use a. 2) Mac OS X (ppc) - must use a. 3) Linux - can use a -or- b. 4) FreeBSD - must use b. 5) Solaris (sparc) - must use a. A Server can be Linux or UNIX host only. 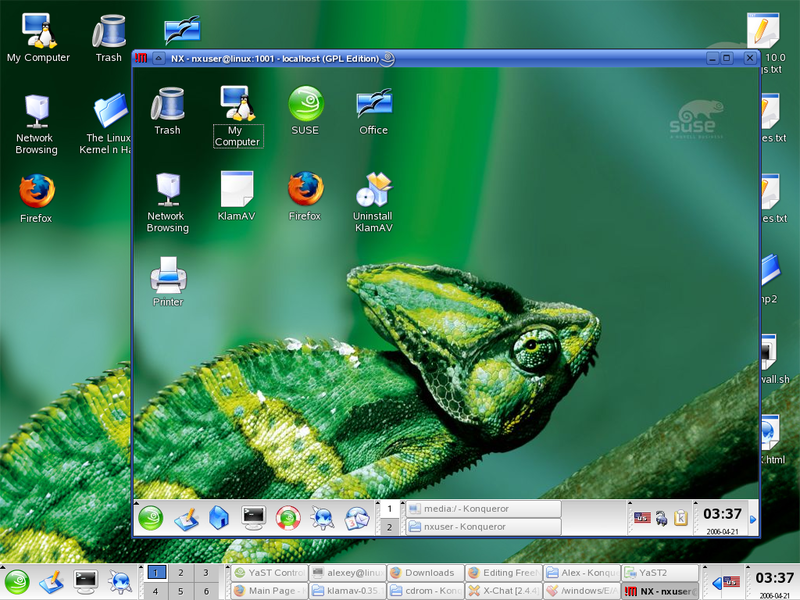 SUSE Linux 10.0 is very well supported. Another UNIXes/Linuxes might need to compile stuff. If KDE4 is installed on the NX server and you attempt to login to a KDE desktop, the NX server will default to a KDE4 desktop. On openSUSE 11.0, startkde starts KDE4 and startkde3 starts KDE3. Because changing NX port on the client is straightforward - I will concentrate on the server here. ...and don't forget to restart the SSH service afterwards. By using this technique - you can effectively setup a farm of Linux distros even on your home PC - using some kind of virtualization (VMware/Qemu/Xen) - by setting up virtual NX servers to listen on different ports. This is really cool - because it can be used from both a LAN and from the Internet at the same time ! The NX Server can run in runlevel 3 or 5. NX Server doesn't use video card, so it will work. Then reconnect your NX Client and that's it. You should now have a working international keyboard. FreeNX, NX, rdesktop do not ship with SLE 10, so you must download an RPM from the OBS Project. Deze pagina is het laatst bewerkt op 8 okt 2010 om 18:53. Deze pagina is 3.541 keer bekeken.